Gérald Gallant was a contract killer at the centre of a shifting roster of gangsters accused of carrying out 28 homicides and 13 attempted murders over three decades, peaking with Quebec's biker war from 1994 to 2002. Ten suspects were rounded up yesterday, based on evidence Mr. Gallant provided after turning informant. An 11th person facing a murder charge remained at large. In Donnacona, the news was met with stunned mutters that there was always something strange about the man. "I would see him regularly touring around the streets by bike," said Mayor André Marcoux, who lived three streets down from Mr. Gallant. "He really kept a low profile." From his unassuming redoubt near Quebec City, Mr. Gallant was in the middle of a gang war that eventually killed 160 people, police said. He and the 11 suspects targeted bikers, street gangsters and Italian mobsters with little regard for allegiance. They also had little regard for the innocent. At least one of the dead and several of the wounded were described by police as bystanders or victims of mistaken identity. "I think this may allow me to close the circle," said Hélène Brunet, a former waitress who was shot in 2000 when a Hells Angels associate used her as a human shield. She became an outspoken critic of gangs. "It's a great relief and it restores some of your faith in justice. "Hells loan shark Robert "Bob" Savard died in the attack on Ms. Brunet. Mr. Gallant's stunning conversion from prolific hit man to police witness began in 2001, when he left his DNA at the scene of one of his final murders. But it wasn't until an RCMP tip, followed by a DNA match in 2006, that police started following him. He got wind police were onto him and fled to Europe in 2006. Months later, Swiss police snagged Mr. Gallant for credit card fraud and sent him back to Canada. In 2008, he suddenly and quietly pleaded guilty to the 2001 murder of Yvon Daigneault, a bar owner in the Laurentian town of Ste-Adèle. The plea was unusual for a man facing a tough automatic sentence of life in prison, with no chance at parole for 25 years. Police made it known Mr. Gallant claimed he had killed 26 people, but they added few details. The whiff of possible exaggeration dissipated rapidly yesterday, as police unveiled the list of 11 people charged with murder, including one-time leaders and members of competing Quebec gangs. Lieutenant François Doré, a senior provincial police spokesman, refused to say if a deal was struck with Mr. Gallant, who is not currently charged with any other crimes. Gang expert and author Julian Sher said some deal may be in the works, but hired killers occasionally seek to settle accounts. "I wouldn't call it conscience, but there is an element of wanting to clear the air, or wanting to get back at past masters," he said.Some arrested suspects, such as Frédéric Faucher, a former leader of the Rock Machine, and Raymond Desfossés, an alleged high-ranking member of the West End Gang, are alleged to have ordered hits. 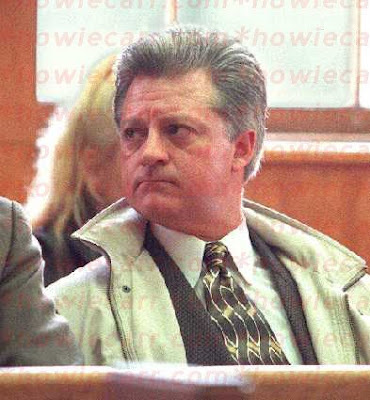 One of the more prominent dead was Paul Cotroni, the son of Montreal mob boss Frank Cotroni, who died in 1998. Alexis Aguilar fatally shot a man in the back on March 4, 2007, after confronting him in Acosta Plaza. Alexis Aguilar fatally shot a man in the back on March 4, 2007, after confronting him in Acosta Plaza. Authorities said the man was walking with his 10-year-old son and was shot in the back as he tried to run away.Judge Timothy Roberts, who presided over both of the defendant’s jury trials, sentenced Aguilar to six years for the gang charge with use of a firearm, one life term for first-degree murder and one life term for the use of a firearm causing death. Aguilar will not be eligible for parole until he has served 56 years.The victim's family was present and the father of the victim addressed the court. On behalf of his family, the father expressed his great sorrow and sadness over the brutal slaying of his son. Kevin Gary was arrested and charged with gang conspiracy,he was a member of a local Bloods gang called Tree Top Piru, known for his signature red contact lenses and for dealing drugs, according to a statement of facts he signed as part of his January guilty plea agreement.On Friday, during an emotionally charged hearing, he was sentenced to 30 years in federal prison.Gary's family and friends asked to be heard, passing a microphone through the courtroom, outlining his acts of kindness. They knew Gary as the young man who took neighborhood children to the swimming pool and volunteered at the Rose Street Community Center. They didn't know the "monster" portrayed in court. "They see past the bandanna, past the red contacts … past all of that. They just see me," Gary, 27, said to the judge. "[The prosecutor] spilled everything I did wrong, so my family spilled everything I did right. "Gary was once held up as the face of gang life in Maryland, Assistant U.S. Attorney Jason M. Weinstein said, referring to a 2007 Baltimore Sun story in which Gary said gangs are unfairly portrayed and that they give youth structure and uplift the community. "Nothing could be further from the truth," Weinstein said. "If [kids] follow in those footsteps, those footsteps will lead right here. "In his January plea agreement, Gary admitted witness intimidation, ordering gang members to rob drug dealers and unsuccessfully arranging a murder. But that's not the Gary his supporters described.Clayton Guyton, director of the Rose Street Community Center, said Gary was someone who cared deeply about his neighborhood and worked to make it a safer place. He bought school supplies for children and spoke to church youth groups, his mother said. He was "just a kid who made a mistake," his father said.They saw him as a victim of the system, someone who never had a chance. "The anger is understandable because this is someone they love, and he's getting ready to go to jail for a long time," said U.S. District Judge William D. Quarles.But Gary has a duty to strike down their belief that "their government is railroading them," the judge added. "Mr. Gary has some responsibility to them to [help] them understand the truth." Philip Collopy, 29, a top member of a feared feuding gang in Limerick, apparently didn’t realise his Glock 9mm pistol was loaded when he pointed it at his head and pulled the trigger. Investigating gardai were able to rule out any foul play in the death almost immediately after one of his associates handed over footage of the shooting he had taken on his mobile phone. Five or six people at the party were all being “unusually fully co-operative” because they didn’t want to be done for the killing, said one Garda source. Detectives believe Collopy, whose gang has been targeted by Ireland's Criminal Assets Bureau (CAB), was messing about with associates at his friend’s house in the early hours of Saturday morning when he unwittingly killed himself. It is believed there were drink and drugs taken at the party. One of the men in the house, in troubled Limerick housing estate St Mary’s Park, ran outside for help and alerted two officers on patrol from the Garda’s armed Regional Support Unit, set up last year to tackle gangland violence in the city. Mahmoud "Mick" Hawi president of one of the nation's strongest outlaw motorcycle gangs the Comanchero.He is married with two children, reportedly owns a number of properties and is, in the words of one friend, "f. . .ing loaded". And, as president of one of the nation's strongest outlaw motorcycle gangs the Comanchero, Hawi is very, very powerful. It is a power he wielded yesterday when he publicly appealed for bikies to stop the violence. His position put him in physical danger at Sydney airport on Sunday when, according to bikie sources, he was caught up in a brawl and stabbed in the arm. Hawi is said to be extremely careful about his personal security, travelling in bulletproof cars. In November 2007, Hawi was inches from death when a car he was travelling in was hit by bullets outside Grappa Ristorante in Norton St, Leichardt. It was about 2pm on the busy Italian restaurant strip when two men pumped up to 10 shots into an Audi and a Mazda as they sped away. The story goes that a bullet lodged itself in Hawi's headrest. Hawi was allegedly the main target, the other being his right-hand man Daux Ngakuru. A court was told neither man gave a statement to police. Silence is the bikie code. Hawi's profile is lower than his contemporaries, including Rebels president Alex Vella and Nomads president Scott Orrock. Both are frequently in the news - almost always in their colours or on a motorcycle. Hawi is slightly glamorous. He takes great care with his grooming and his clothes and jewellery are expensive. "He is very, very smart and people are jealous. He's f. . .ing loaded, he's got properties all over the place," one associate said. Beirut-born Hawi is rumoured to live in Brighton-Le-Sands but keeps his actual address secret. His crew is largely based in the Brighton-Le-Sands area. He has been a driving force behind the trend of bringing young men of Middle Eastern backgrounds into the bikie fold. Following the Cronulla riots in 2005, he appealed for calm and met with the Bra Boys. Whether this public appeal works will have very real consequences for Hawi himself, his Comanchero crew and for the Sydney public at large. Mexican federal authorities used bulldozers to bring down more than 30 chapels devoted to “Saint Death” - a figure that is worshipped by drug traffickers - in the northern city of Nuevo Laredo, the daily Reforma reported Wednesday.The image of the saint is a skeleton dressed and adorned as a woman, and is not based on any particular Roman Catholic saint. Many criminals, but also people without a criminal record and even police officers, have taken it as their patron saint. Although the figure is venerated by people from many walks of life, the saint has been adopted by drug gangs. In recent years, there has been a proliferation around Mexico in the construction of such chapels - varying in size from small shrines to larger buildings - from materials including brick, marble, iron and tiles. 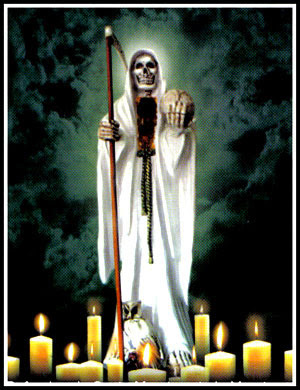 They use Roman Catholic symbolism and ceremonies, although the formal church rejects worship of “Saint Death” as a pagan tradition and the authorities have long removed the tradition from the list of the country’s religious associations. In Mexico City, there is even a sanctuary and a so-called bishop - a man with no known ties to drug trafficking - for worship of “Saint Death.”According to the report in Reforma, the chapels that were destroyed in Nuevo Laredo were on an access road to the city. One was a two-floor building and featured a 2-metre-tall image of Saint Death.The owner of one of the altars told reporters that he had spent some 13,700 dollars to build it and decorate it.“When you go in or out of Nuevo Laredo you see these chapels, which are most impressive, spectacular, but people constantly complain that they give the impression that this is a place for criminals,” an unidentified official source told the daily, to explain the decision. More than 6,300 people were killed last year in Mexico in incidents linked to organized crime and drug trafficking. The authorities have massively deployed soldiers and federal police officers to combat crime. Manuel Marquez, also known as Morro, was sentenced after pleading guilty in December to a pattern of racketeering activity that included murder, attempted murder and witness tampering.Marquez is the last of the defendants to be sentenced on the Racketeer Influenced and Corrupt Organizations Act, known as RICO.Fourteen gang members were indicted and charged in January 2007 with racketeering conspiracy, murder, attempted murder, assault, weapons charges and obstruction of justice. Marquez admitted to planning and participating in several 2006 shootings. He also stated that he and other gang members shot and killed two rival gang members sitting inside a car at a traffic light, and that he and another gang member shot a rival gang member several times in the back at Percy Priest Lake outside Nashville. Ronald Fuentes, the leader of Nashville's MS-13 gang, which is also known as La Mara Salvatrucha, will serve life in prison.The MS-13 is one of the nation's most notorious gangs. They are primarily from El Salvador or of Salvadoran descent. Mahmoud Dib , 27, had been charged with six firearm offences after a semi-automatic pistol was found in a car connected to him, police said. Mahmoud Dib , 27, had been charged with six firearm offences after a semi-automatic pistol was found in a car connected to him, police said. He was also being investigated in relation to a string of drive-by shootings.Superintendent Angelo Memmolo said tests were under way to determine if the gun had been used in a spate of shootings at houses and cars in Sydney's western suburbs last week. Police said another incident occurred on Monday night, when four shots were fired at a house. No one was injured and there have been no arrests.The shootings are believed to be part of a dispute between the Bandidos and a gang called Notorious. Police said shots were fired into Dib's house on 16 March and they suspect some of the attacks have been reprisals.A standing state commission into organised crime opened a new investigation into biker violence today following the airport brawl.The men the airport shortly after Anthony Zervas, 29, the brother of a well-known Sydney biker, was struck with metal poles. He died in hospital.Biker gangs have existed in Australia since the late 1960s and turf battles have ebbed and flowed. Gang members are often accused of being involved in drugs, although gang leaders deny involvement in organised crime and say they cannot control individual actions.With the exception of a full-blown gun battle in a Sydney car park in 1984 between Bandidos and Comancheros, most violence had been largely out of the public eye.According to Arthur Veno, the author of the 2004 book The Brotherhoods: Inside the Outlaw Motorcycle Clubs, the emergence in the past few years of Notorious has contributed to an escalation of violence and a worrying trend of indifference to the safety of bystanders. Notorious was a shadowy group that modelled itself structurally on a biker gang but was more involved in crime that motorcycles, Veno said.Rudd and the New South Wales premier, Nathan Rees, said tougher laws against gang violence would be considered in the coming months and the federal home affairs minister, Bob Debus, said airport security would be reviewed. 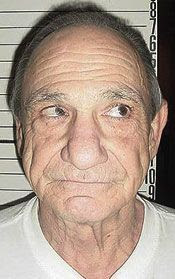 mobster-turned-FBI informant, former North Platte resident, whose life inspired the movie "Goodfellas" is wanted for failing to appear in court on tickets alleging he was drunk in public in San Bernardino.Henry Hill, 65, made quite a splash in North Platte after he moved here and presented a menu for a local Italian restaurant, Firefly.Hill faces two $25,000 arrest warrants. He says he wasn't aware he needed to be present in court Wednesday and had asked for a new hearing date because he was having hernia surgery. "I was hoping the court would understand," Hill told The Press-Enterprise of Riverside from his San Fernando Valley home.The cases stem from two public intoxication arrests in May 2008. Hill said he was in alcohol rehabilitation at the time.Hill was again arrested in Los Angeles earlier this year and released before his arraignment because of jail crowding. "I don't remember much of all that, but I've been sober a month now," he told the newspaper. "I don't want to drink anymore. "The "Goodfellas" movie ends with Hill, played by Ray Liotta, entering federal witness protection after implicating fellow mobsters in murders and the 1978 heist of $5.8 million in cash from a Lufthansa Airlines vault in New York.Drug arrests led to Hill being removed from the federal program in the early 1990s. The infamous mobster whose life story resulted in the movie “Goodfellas,” was charged in Lincoln County Court with multiple crimes during the time he lived here. He was found guilty of possession of methamphetamine and numerous of counts of assault. After an argument with his estranged wife, Kelly, Hill then got into an argument with the former manager of the bar, Dale Norblad, who ordered Hill to leave. Hill repeatedly threatened bar patrons, brandished knives at his wife and others and allegedly cut the tires of his enemies. Drunk most of the time, Hill wore out his welcome in North Platte and spent more than six months in the Lincoln County jail. He fled after he was released for treatment in 2007. Hill has disappointed prosecutors before.By the time his story came out in the movie “GoodFellas” in 1990, Hill had been kicked out of the witness protection program. Since then, he has been convicted of drunken driving in Washington, where he and his second wife, Kelly, formerly lived. But Hill has been able to maintain a life of celebrity based on Scorese’s movie. Hill lived in North Platte several years, published a popular cookbook and helped design an Italian food menu for The Firefly restaurant. He also marketed his Sunday Gravy marinara sauce. 'Goodfellas' ranks best in Brit mag's movie list Martin Scorsese's classic mobster movie "Goodfellas" is the greatest film of all time, according to experts at a British film magazine. The 1990 film, which is based on the exploits of real-life gangster Henry Hill and stars Ray Liotta, Robert De Niro and Joe Pesci - who won an Academy Award for his performance - was No. 1 in a Total Film magazine list published Monday. "'Goodfellas' has it all," the magazine said, "story, dialogue, performances, technique. It is slick, arguably the slickest film ever made. But it is also considered, layered and freighted with meaning." Shane Coates and Stephen Sugg disappeared in January 2004 after leaving their homes in Torrevieja, Alicante. Shane Coates and Stephen Sugg were two of the most ruthless and violent criminals ever involved in the Irish gangland scene. Their Westies gang, based in the Dublin suburb of Blanchardstown, controlled a massive drugs empire in west Dublin in the late 1990s and early years of this decade. "These guys could go from being calm to high-order violence like the flick of a switch. They were real psychopaths," said a retired garda who investigated their activities.Drug users who bought from anybody else in their area were often being beaten or tortured. Street dealers who agreed to sell for other gangs were also dealt with in a similar fashion. In 1999, heroin addict Derek 'Smiley' McGuinness was severely beaten and had his face sliced open with a Stanley knife because he couldn't pay a small debt. A middle-aged addict had her breasts cut with a knife and cigarettes stubbed out on her body. Another addict was thrown off a balcony in the Ballymun flats. Miraculously, he survived.The gang's outrageous violence and drug dealing quickly saw their members becoming priority targets for the gardai. Coates was ambushed by armed officers at a safe house in Co Cavan in 2003.He received a gunshot injury in the ensuing shootout, but was able to escape across the fields and eventually made it to Spain, where he was later joined by Sugg. They later disappeared in January 2004 after leaving their homes in Torrevieja, Alicante.Their bodies were found in July 2006 when their skeletal remains were discovered buried in concrete under a warehouse in Catral, near Alicante. Roman Vidal, age 57, allegedly smuggled millions of dollars' worth of black-market cigarettes through the Port of Miami on behalf of European gangs — including the Real IRA, which claimed responsibility for the March 7 attack on four soldiers waiting for a pizza delivery. The brutal killings — which included execution shots to wounded victims lying on the ground — threaten to derail the peace process in Northern Ireland, with one Protestant leader warning it might signal a return to the "bad old days where people are being killed in open-air gun attacks." Vidal fronted a freight company that imported millions of cigarettes from Panama, hid them under wood flooring and insulation in freighters at the Port of Miami, and then sent them to gangs in Dublin, according to the complaint. He has been charged with four counts of federal wire and mail fraud.In February 2006, an informant tipped off Immigration and Customs Enforcement officials in Miami to Vidal's scheme, and agents began watching Vidal's business and checking his shipments.They found that the previous December, Vidal had shipped 7.3 million cigarettes from Panama to Miami, purchased wood flooring at a local hardware store, and then covered the shipment with floorboards. When the cargo arrived in Dublin, Vidal's Irish contacts paid only $2,900 in tariffs and pocketed the $2.1 million they avoided in taxes.Vidal pulled an identical scheme last February, ICE agents say, shipping to the UK about 6 million Panamanian cigarettes hidden under building insulation.As agents dug into Vidal's illegal enterprise, they learned he worked for "a criminal organization that has associates operating in Spain, Ireland, and other European countries as well as in the Southern District of Florida," according to the criminal complaint. Evidence indicates some of these associates were connected to the Real IRA.Vidal, who has pleaded not guilty and has been released on house arrest, could not be reached for comment. Giovanni Strangio is wanted by investigators in Italy over a multiple killing at Duisburg in Germany two years ago that earned comparisons with the infamous St Valentine's Day Massacre in ­prohibition-era Chicago. Six people, including a 17-year-old boy, were shot dead outside a restaurant where they were suspected of celebrating an initiation into the 'Ndrangheta, the mafia of the poor, southern Italian region of Calabria. Police in Italy said 29-year-old Strangio was found living in the centre of Amsterdam with his wife and son. His brother-in-law, Francesco Romeo, was also arrested. Though Strangio was placed on Italy's most-wanted list over the murders in Germany, the story behind the killings led back to the small but notorious hillside town of San Luca, in Calabria, often described as the spiritual home of the 'Ndrangheta. Its clans have for years been bloodily divided by a feud in which Strangio's family was a prime actor. Investigators believe he assembled the four-man hit squad that struck in Duisburg to avenge the Christmas Day killing in 2006 of his cousin Maria Strangio. She is thought to have been killed unintentionally in an ambush primarily directed at her husband, the leader of one of the two factions in the gang war that has rent San Luca and upset the internal workings of the 'Ndrangheta. The Calabrian mafia, which many police and prosecutors believe has overtaken the Cosa Nostra to become Italy's top crime syndicate, controls much of the cocaine trafficking into Europe from Latin America. www.colingunn.net – gives his address as HMP Whitemoor in Cambridgeshire. Bestwood gang leader, who is serving 35 years, will use the site to "restore positive thoughts" about him.Gunn has already used it to attack "rumours and hearsay" in the media, saying he will "tackle head-on" any allegations against him. But Notts Police Authority chairman Coun John Clarke said: "It's highly unusual that any prisoner can set up anything like this. "I will certainly be asking questions about this with our Police Minister Vernon Coaker MP and the Home Secretary." North MP Graham Allen said he would check whether the site broke prison service rules. "I will be raising it with the relevant authorities to see whether this is a legitimate thing to do," he said.A handwritten letter from Gunn, dated February 25, appears to have been scanned and posted online by someone outside the prison. In it, Gunn said: "I might not have the writing skills of those reporters or access to their resources and readerships, but I hope, after all the negativity, to restore some positive thoughts of me in the minds of people that call me a friend. "We will see exactly who has been 'hoodwinked' because it's time for the authorities and the gutter press to put up or shut up. "Watch this space everyone, I will never give in and will fight anything in front of me 100%. "Gunn was jailed in 2006 for masterminding the revenge murders of John and Joan Stirland, who were executed in their seaside home in 2004.He was also given a nine-year sentence for using police insiders to feed him information.Gunn, 41, failed in a bid to get that conviction overturned.The website – www.colingunn.net – gives his address as HMP Whitemoor in Cambridgeshire. "As this website grows and develops over time, I hope to tackle the various stories and allegations you've no doubt read and talked about," he wrote. "Please be patient though, as unfortunately it will be down to the establishment on how quickly I can respond to the stories or your questions. "The website address is registered to Gary Sansom at a business address in Hucknall.Today Mr Sansom said he was not responsible for setting up the site and had allowed a friend to use his web space.A spokeswoman for the Prison Service said: "We are unable to prevent third parties from publishing information on other people's behalf." All prisoners in maximum security jails may have their mail checked, but it was not possible to read every letter.Prison service rules state that prisoners are not allowed to send material in the post for publication about their own crimes "except where it consists of serious representations about conviction or sentence". Gunn and his associates featured in Hoods, a book by freelance journalist Carl Fellstrom. The book has now sold 12,000 copies and will be released in paperback later this year.Mr Fellstrom said: "He is someone who had an ability to organise people in a very vicious way and if it's being used to gather together that support again, that's a bad thing for Bestwood. "Notts Police said the website was a matter for the Prison Service. John Gizzi walked away from court a free man last week after a dramatic release. Rhyl’s “Mr Big” walked out of Mold Crown Court on Thursday under tight police security.The 36-year-old spent three years behind bars for conspiracy to supply counterfeit cigarettes and serious assaults.The man who was once described as ruling the town on threats and intimidation was due for release last December but was put behind bars for another seven years after failing to pay back £2.6m under the Proceeds of Crime Act (POCA).An original order found Gizzi had benefited to the tune of £6.89m from his crimes.But a judge at Mold decided the £1m he had paid back was enough to secure his release, as the £2.6m figure had been calculated before the current downturn in the economy.Gizzi raised the cash by selling off his assets – including a luxury home in St Asaph, originally valued at £1.7m but eventually sold for £850,000.As well as the mansion, 20 other mortgage properties were sold, and a Rolex watch.Four number plates – JDG 1 to 4 – had also been sold along with a fleet of luxury cars including a Bentley Continental, RangeRover and a Mercedes.Judge John Rogers QC discharged the POCA confiscation order and Gizzi was formally released at about 2pm.After completing paperwork, he was covered with an umbrella, and bundled into the back of his parents' RangeRover Vogue, just after 4pm.He was then driven across the road to The Glasfryn public house where he was joined by family members. Gizzi’s trial in 2006 heard he was a "thug" and "bully" who assaulted homeless people and preyed on the weak and vulnerable.A prosecution application that Gizzi should be responsible for the costs of the Crown Prosecution Service and the receiver appointed to sell the property was rejected.The judge said those costs should come out of the reduced order. But the court heard the regional asset recovery team could pursue Gizzi for more money if they thought he could afford it in the future.In 2006 Gizzi admitted two charges of causing grievous bodily harm, one of assault causing actual bodily harm and one of conspiracy to supply counterfeit cigarettes.He also asked for 22 offences of mortgage fraud – involving almost £1.5m – to be taken into consideration. Louis Pasquin is believed to be the first lawyer in Canada to be convicted of gangsterism. Louis Pasquin is believed to be the first lawyer in Canada to be convicted of gangsterism.Pasquin looked shocked as he heard the verdict, which was delivered by Quebec court Judge Carol St-Cyr after nine months of deliberation.Pasquin, 49, has been a lawyer for more than 20 years and has also represented members of the Montreal Mafia.St-Cyr said Pasquin's explanations during testimony didn't hold water. "Your testimony did not withstand analysis, is unlikely and not credible," the judge said.St-Cyr said he didn't believe Pasquin when he said he was unaware of the activities of two other men arrested in the case. "The caution he used in his conversations and the cryptic language show that contrary to his assertions he knew perfectly well about their activities," St-Cyr said.Evidence at Pasquin's trial suggested he acted as a liaison between a drug ring leader and a pilot who allegedly made cocaine runs. defense attorney representing one of six men charged with running organized crime through a street gang asked a federal judge this morning to tell the jury that none of the evidence supports the charges. "All they're trying to show is that he's a bad guy," said Craig Shultz, who represents Lonnie Wade.Shultz said the testimony so far has failed to support charges of rackeetering via the Crips street gang.U.S. District Judge J. Thomas Marten said such an instruction was improper at this point. He said prosecutors were trying to establish certain criminal acts before they got to the heart of their case.Federal prosecutors have spent the week building a time line of crime from 1991 to 2007, when the charges were filed. Testimony continues today before Marten.Prosecutors have had to work around reluctant witnesses, who fear retribution by the Crips -- the gang the men are accused of belonging to -- even in retelling crimes they witnessed more than a decade ago.The Eagle is filing live updates from the courtroom, a first for Wichita federal court. Follow the updates in the box at right by refreshing the page. James “Pancake” Taylor was picked up by police trying to stop a violent drugs war that has broken out on the Costa del Sol. Liverpool gangster was today behind bars in Spain after being arrested for attempted murder.James “Pancake” Taylor was picked up by police trying to stop a violent drugs war that has broken out on the Costa del Sol.The 29-year-old is also being investigated over claims he is the ringleader of a gang which has brought terror to the sunshine streets.A leaked report to a Spanish judge over a spate of shootings says the gang is a “worldwide organisation that is dedicated mainly to drug trafficking, targeted assassinations and has a hierarchical structure among the members, almost all of whom originate in Liverpool and Manchester”.Taylor was arrested over the shooting of a Brit after a nightclub brawl last August. An application by prosecutor Simon Mills that Gizzi should be responsible for the costs of the CPS and the receiver appointed to sell the property was rejected. The judge said those costs should come out of the reduced order. However, the court heard that the regional asset recovery team could pursue Gizzi for more money if they thought he could afford it in the future. Judge Rogers told Gizzi: "As the crown point out, the actual benefit figure is a very much higher figure. "It may well be that the crown will seek, if circumstances permit, to obtain further monies. That is a matter which must await events." The judge said the fall in the property market was to blame for the lower-than-expected sum repaid, and not Gizzi. It was previously found that Gizzi had made "tainted gifts" to his parents' building firm in the form of a building plot in Towyn, and a property in Rhyl. The plot, which now has four houses on it, is due to be sold this week to his parents for £430,000. Gizzi had previously admitted two charges of causing grievous bodily harm, one of assault causing actual bodily harm and one of conspiracy to supply counterfeit cigarettes. He also asked for 22 offences of mortgage fraud - involving almost £1.5m - to be taken into consideration. Police had been searching for 22-year-old Oswain Walcott, whom they wanted to question in connection with the death of 18-year-old Bradley Paul. After searching for days, authorities found Walcott in an apartment complex at 119th Street and Northeast 16th Avenue on Wednesday afternoon. Miami-Dade police said there was a confrontation at the complex. Police said Walcott reached for his waistband while yelling to officers, and police opened fire, shooting Walcott. He was airlifted to Jackson Memorial Hospital, where he died Wednesday night. Officers from both the Miami Beach and Miami-Dade police departments fired shots during the confrontation, Local 10's Elena Echarri reported. Investigators are trying to determine who actually shot Walcott. Before authorities found him, Miami Beach police called Walcott "extremely dangerous" in a news release Wednesday as the manhunt continued. On Tuesday, officers knocked on Walcott's door to talk to him about Paul, who was found dead in an alleyway in the 1000 block of Lenox Avenue on Saturday. When Walcott saw officers at the door of his apartment, he took off, police said. Miami Beach police said Walcott broke into a South Beach home and held a family hostage from Tuesday night into Wednesday morning, fondling a teenager during that time. Walcott then ran to another apartment, where a woman was hurt, police said. She was taken to Jackson Memorial Hospital in critical condition. Police have not released details on how the woman was injured. Police have not yet ruled Paul's death a homicide. Police would not comment on the cause of Paul's death, how they believed Walcott might have been involved or what he might have been able to bring to the case. An arrest warrant also was issued for Walcott in Georgia on a theft by burglary charge, Miami Beach police said. Police are also looking for 28-year-old Romado Stephens for questioning.